H4 Work Authorization, Work Permit or H4 EAD and H4 Visa Issues: Should someone keep the OPT or move to H4 EAD? We are getting many calls of people confused whether they should move to H4 and ultimately the H4 EAD application rather staying or picking the OPT. The answer is not that simple. It is on a case by case basis. Since the OPT is attached to the F1 student visa, it is independent of the H1B spouse who actually maintains the H4 visa. This becomes valuable especially if the H1B holder's job is not stable or the marital relationship is not in good shape. The OPT work permit has long been long established and is a solid form of EAD and has withstand years in the industry while the H4 EAD is new and has not yet established itself. The biggest advantage of the H4 EAD is that you are not limited in the type of employment you are seeking including opening your own business unlike the OPT. 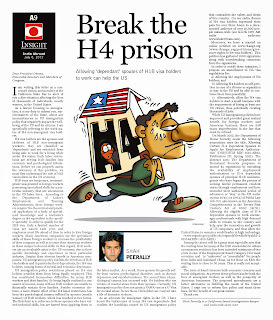 The H4 EAD does not require that you constantly work. You can keep the EAD even though you do not want to work. On the H4 EAD, the H4 visa to which the EAD is attached is only dependent on the H1B visa holder's status not on any type of SEVIS system like the OPT. Depending on your situation, either the OPT or H4 EAD might be a better choice. This is why you should talk to an attorney before you make a decision which one to pick. Feel free to call the Shah Peerally Law Group PC at (510) 742 5887, should you have any questions.